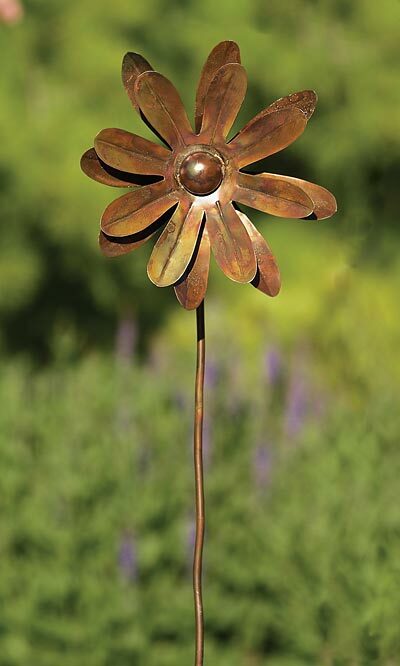 Celebrate exotic flowers and wind power in your yard with the Ancient Graffiti Kinetic Zinnia Spinner. Showcasing a spinner in your garden brings exciting movement to the area, and this one will surely offer both style and fun. A 32" tall, steel shaft supports the spinner, placing it at just the right height to nestle within your shrubs. The 8" diameter topper mimics a zinnia in full bloom, with its dual layers of petals and a circular, center hub. The front petals remain stationary, while the back disc spins in a breeze. The flamed copper colored finish brings dimension and an elegant look to the unit, while its steel construction ensures a sturdy piece. A 3" long, step-in base keeps the item stable in your landscaping, and makes installation simple. Enjoy a floral look in your garden throughout the year with this Kinetic Zinnia Spinner.